Lisa Schott, the inventor of Shut-Eye™ Acoustical Shutters and owner of Quietly Making Noise, LLC (QMN), is committed to giving back to charitable causes near to her heart. Four primary organizations that benefit through donations of time and money from QMN are the Astronaut Scholarship Foundation, Give Kids the World, the Arthritis Foundation on behalf of Kids with Arthritis, and the Foundation for Seminole State College. Astronauts from the Mercury, Gemini, Apollo, Skylab, and Space Shuttle programs, along with industry leaders, educational institutions, and patrons are helping the United States retain its world leadership in science and technology by providing scholarships for college students who exhibit motivation, imagination, and exceptional performance in the science or engineering field of their major. To date, the foundation has awarded over $5 million in scholarships to more than 500 deserving students. The Astronaut Scholarship Foundation annually hosts its current and past scholars at the Astronaut Hall of Fame Induction weekend. 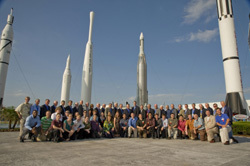 The scholars and astronauts are pictured above at the Rocket Garden at the Kennedy Space Center Visitors Complex. The Astronaut Scholarship Foundation was founded in 1984 by the six surviving original Mercury 7 astronauts, Betty Grissom (widow of the seventh, Gus Grissom), Henri Landwirth (see below), and Dr. Bill Douglas, the Mercury 7 flight surgeon. Lisa Schott has served on the Board of Directors of the Astronaut Scholarship Foundation since 1997 and is Founder and President of ASF’s alumni group, the Astronaut Scholars Honor Society. She received the scholarship award from 1987-1990 while studying at Georgia Tech and has been a tireless volunteer since then. Lisa initiated the annual convention of scholars and alumni in Florida, where current and past scholarship winners meet each other and astronauts from the Mercury, Gemini, Apollo, Skylab, and Space Shuttle programs. Through these activities, a strong network of some of the leading young scientists and engineers in America has formed. The ASF Board of Directors is: Curt Brown (Chairman), Lisa Schott (Vice Chairman), Michael Neukamm (Secretary), Vincent Cimino (Treasurer), Tammy Sudler (Executive Director), James A. Lovell (Chairman Emeritus), Scott Altman, John Blaha, Larry Bradley, Dan Bradenstein, Kevin Chilton, Richard Covey, Charles Duke, Chris Ferguson, Fred Gregory, Joseph Han, Jeff Hoffman, Charlie Precourt, Brewster Shaw, Kathryn Thornton, and Al Worden. Please visit the ASF web site at www.AstronautScholarship.org for more information or to learn how to make a contribution to this worthy cause. GKTW was founded by Mr. Henri Landwirth, a survivor of several Nazi death camps and labor camps including Auschwitz, Matthausen, and Ostrowitz. At the end of the war, Henri was marched into the woods to be shot, but at the last minute a Nazi soldier decided to spare his life, and told him to run. The miracle that saved Henri’s life and his subsequent incredible life journey brought him to America and eventually led him to become a very successful businessman and friend to the original Mercury 7 astronauts. Lisa Schott met Henri through the Astronaut Scholarship Foundation. He has been such an inspiration to Lisa, that she began volunteering at the Give Kids the World Village in Kissimmee, Florida in 1991. GKTW Village has welcomed more than 160,000 families from all 50 states and over 75 countries, providing a free week-long vacation in Orlando, Florida. QMN has adopted two of the family villas. With a large crew of friends and family, QMN provides maintenance, deep cleaning, landscaping, and other services for these villas three to four times per year with the goal of keeping them in top condition for the visiting families. The QMN group also decorates the villas and several other buildings in the Village each year for the Christmas holidays! In 2014, QMN served on the Steering Committee for Extreme Village Makeover, a massive undertaking to renovate all of the villas with the latest interior design finishes and state-of-the art appliances and fixtures. Please visit www.gktw.org for more information on this worthy cause. The inaugural Fruitcakes in the Alley bowling tournament raised $10,000 for the Arthritis Foundation to benefit Kids with Arthritis. 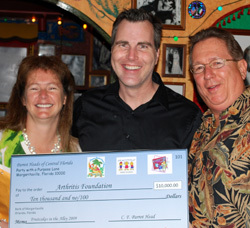 George and Lisa Schott presented the donation to Tony Ward (center), Community Development Director for the Arthritis Foundation’s Central Florida office. Starting in 2008, Lisa Schott and her husband, George, became the chairpersons for an event that benefits the Arthritis Foundation. This is in honor of George’s late daughter, Jennifer, who had a very severe case of juvenile rheumatoid arthritis. The event is called the Fruitcakes in the Alley bowling tournament. It is sponsored by the Parrot Heads of Central Florida, a not-for-profit social organization with deep ties to the needs of the Central Florida community. The Parrot Heads main interest is giving back and, of course, having a good time doing it! Members include singles, couples, and families interested in “leaving this world a little better than we found it”. In its inaugural year, the Fruitcakes in the Alley event raised over $10,000 for the Arthritis Foundation. The 9th annual event in 2017 raised over $53,000, bringing our 9-year total to more than $294,000! Please visit www.fruitcakesinthealley.com for more information. Most people don’t realize that Juvenile Arthritis affects an estimated 300,000 children in the United States alone. Juvenile Rheumatoid Arthritis (JRA) is the most common type of arthritis in children and is usually diagnosed between the ages of two and sixteen. The disease often affects joints but can also involve other organs as well as weakening a child’s immune defense system. It is an incurable autoimmune disease that can have a devastating, life long impact on children. In some cases it can be life threatening. The causative agent of JRA is still unknown but research is ongoing to find the cause and to develop medications to treat, and hopefully prevent, this devastating disease. From the Arthritis Foundation Florida Chapter, eighty three percent of all funds raised stays in the community where it is raised. In Central Florida, these proceeds are earmarked for Children’s Miracle Camp, where children living with juvenile arthritis attend a four day camp designed especially for them at Camp Boggy Creek. The funds are also used to sponsor aquatic, exercise, and self help programs designed for the one in three people who have arthritis in our area, in addition to offering public education and assistance. Please visit www.arthritis.org for more information. The Jennifer L. Schott Memorial Endowed Scholarship is administered by the Foundation for Seminole State College. Lisa Schott and her husband, George, honor the memory of his daughter Jennifer with an endowed scholarship in her name at Seminole State College of Florida. Jenny attended Seminole State College (then known as Seminole Community College) and was a leader among her peers. She was Founder and President of a support group for disabled students, called “Inside the Outsiders”, in which students dealing with handicaps could come together, share experiences, and provide support to each other. She also tutored students from local elementary and high schools and even other college students. She graduated from SCC with High Honors and Distinction with a 4.0 GPA, was a member of Phi Theta Kappa Honor Society, and received an Associate of Arts degree in Mathematics. 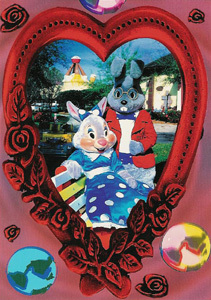 Jenny passed away in 2004, at age 26, after a life-long battle with juvenile rheumatoid arthritis. One of her last wishes was a very unselfish one, to create a scholarship for handicapped students at SCC. Today, the Jennifer L. Schott Memorial Endowed Scholarship, which was started completely with donations in her memory, is awarded annually at Seminole State College to provide financial assistance to other handicapped students to inspire and achieve success in their future endeavors. George and Lisa Schott are active supporters and participate in choosing the recipients of the scholarship. Please visit www.seminolestate.edu/foundation/ for more information about the history and all of the programs of the Foundation. Copyright © 2013-18 Quietly Making Noise LLC. All rights reserved. Site designed by Orlando Web Design.